Ixobelle (archived): Uhh... Can Anyone Login to Aion? Uhh... Can Anyone Login to Aion? I've got like two emails from NCSoft telling me to log in and ZOMG PLAY! 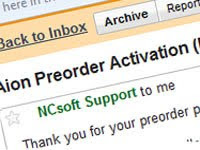 I've bought and activated my preorder code (which I apparently bought after all the early access crap was already over). I've played the Chinese client for a few hours a few weeks back... wtf? Now the Aion page says open beta is underway, and I downloaded some 3gb patch, but the client itself is some horrendous front end where it launches the entire Crytek engine for a login screen, you try to log in, and it's like 'can't reach authorization server' and then craps out and QUITS. Not just gives and error and sits there, but shuts down, and forces you to relaunch the entire client (~15-20 seconds) just to try again. Has anyone actually gotten in? I'm redownloading an entire installer (9gb torrent), but it's gonna take a while. I'm really busy today with some illustration work, but want it to be ready to launch when I am. Just so you know, Aionsource is ran by Curse and they do have NCsoft dev's post on thier forums quite regularly. Good place to post/troll in if your interested in Aion! Also, in reference to the email, I think that is some sort of confirmation that you will be able to log into the headstart program on the 20th because you preordered. I also got excited and thought I could play when I first read it too, but it turned out the cake was a lie. Sorry about all these posts. @Azryu: Thanks for the heads up, for now I guess I'm just waiting with the herd. NCsoft seems to want to make things needlessly complicated. They're only letting you download so much of the patch per day. For instance, of the 3000 megs, I downloaded 150 last night and then the downloader just stopped and the game appeared with a green light. It wouldn't launch though. Tonight, the downloader started back up. I am just going to go to fileplanet or use the torrent to download the entire patch so I don't have to worry about NCsoft's fucked up way of doing things. Also, you decided if you are going to roll Elyos or Asmodian at launch? gonna throw up a new post answering that in just one sec!